For those of you who have been waiting for a more affordable quad-core processor tablet, the time may arrive soon. The Asus Transformer Pad 300 that was announced earlier this year at MWC 2012 is expected to hit the US starting from the 22nd of April. Albeit the absence of a definitive price list yet, PCWorld has reported that the Transformer Pad 300 is expected to go on sale at a starting price of approximately $379 for the 16GB model. The Transformer Pad 300 is essentially a more economical and skimmed version of the Eee Pad Transformer Prime tablet. The device will be equipped with NVIDIA's Tegra 3 quad-core processor that powers the Transformer Prime but will be clocked at a lower speed. 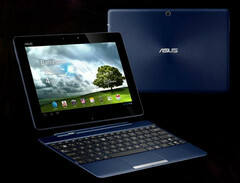 It will also feature a 10.1-inch touch screen IPS display with a resolution of 1280x800 pixels. The only difference in the display is the lack of an IPS+ function which increases the brightness in the Transformer Prime's display to about 600 nits. Despite earlier announcements that it will only be available in a 16GB version, there have been words going around on the likelihood of a 32GB model with 1GB of RAM being released concurrently. As for the external looks, unlike the Transformer Prime’s aluminium casing, the Transformer Pad 300 will be fitted with a plastic casing along with a keyboard dock and will be made available in three different colors; Blue, white and red.